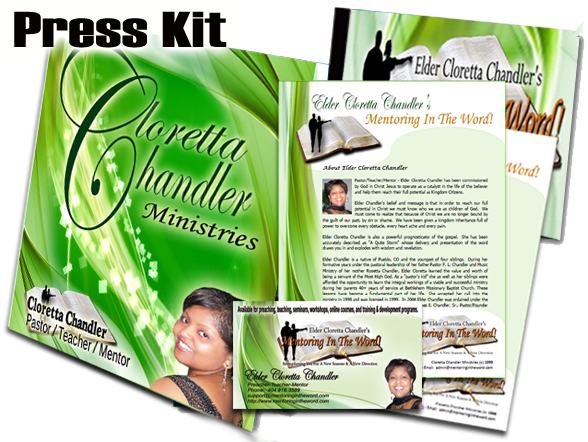 Elder Cloretta Chandler has a passion for teaching and ministering God’s word. Through her ministry and spiritual teaching Elder Chandler has inspired hundreds to develop a closer walk with the Lord and live a life pleasing unto God. Elder Chandler’s purpose is to provide guidance as a pastor, spiritual nurishment as a teacher and support as a mentor ”until we all come to the unity of the faith” and manifest the completeness of the Glory of God (our full potential) through Christ Jesus our Lord. My mission is to train, equip and empower the people of God for the work of the ministry and the advancement of the Kingdom of God on earth. In executing this mission conferences, workshops and mentoring programs will be made available to all who want to develop a closer walk with the Lord. To support this mission all lawfully and morally correct means will be employed to finance this great commission.